The sockeye were running and we were floating! The Cedar River flows into Lake Washington from the south, and Lake Washington drains to Puget Sound through Seattle. 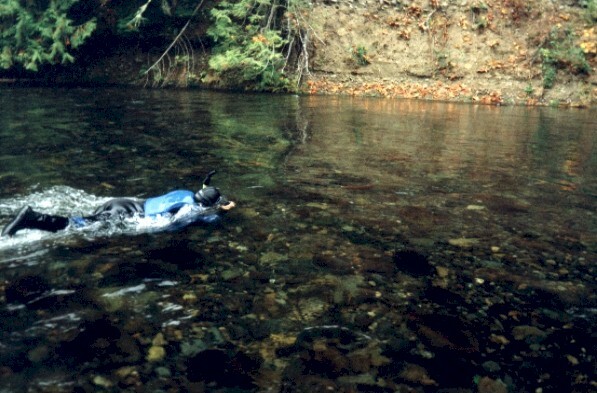 The Cedar River supports runs of several salmonids-- chinook salmon, coho salmon, sockeye salmon and steelhead. 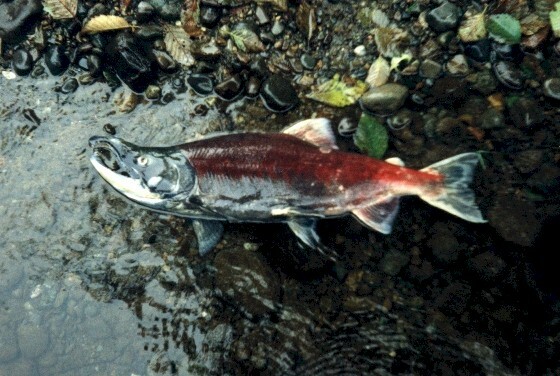 Its run of sockeye salmon (Onchorhynchis nerka) is one of only a few in Washington. Sockeye are more common in larger rivers in British Columbia and Alaska, but are found as far south as the Klamath Basin, California. Unlike other Pacific salmon, sockeye require a lake in their life history, and there aren't many natural lakes in Washington. Mature adults return to freshwater in the summer, spend the summer in a lake, then swim to their natal stream to spawn in the fall. Their eggs hatch during the winter. Early the following year, the fry return to the lake, where they spend a year before going to the Pacific Ocean. They then spend one to four years in the ocean before returning to spawn. 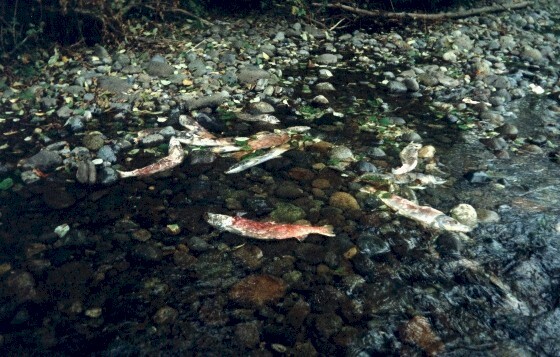 While in fresh water, juvenile sockeye feed mainly upon zooplankton (such as ostracods, cladocerans, and copepods), amphipods, and insects. In the ocean, they continue to feed upon zooplankton, such as copepods, euphausids, ostracods, and crustacean larvae, but also prey upon larval and small adult fishes, and occasionally squid. Cedar River sockeye spawn in October, and on this October Saturday Jeff and Katrina Kruse invited me to join them kayaking, snorkeling and fish-watching on the Cedar River. When we met on the river in mid-morning it was chilly and foggy. 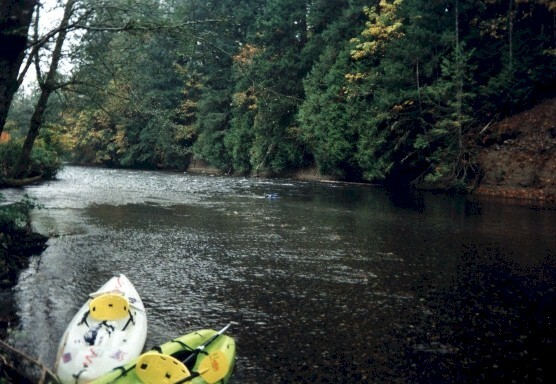 We put on drysuits and began kayaking downstream. Occasionally we snorkeled-- we just floated face down and looked down through the clear (and cold!) water. In the deeper water we saw steelhead (or rainbow trout), sockeye and mountain whitefish. In shallower water we turned over rocks and saw longnose dace, torrent sculpins and Coastrange sculpins. The river was flowing fast and there weren't many places where we could hold our place in the current. 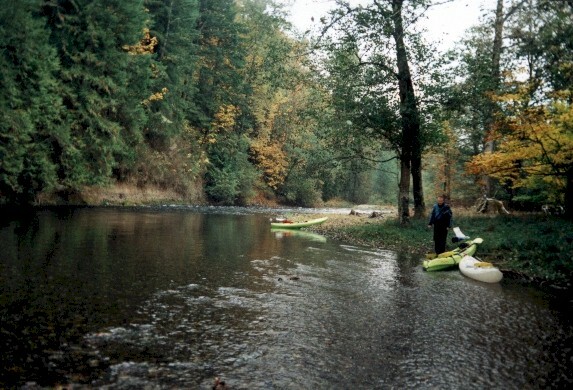 Looking upstream on the Cedar River. 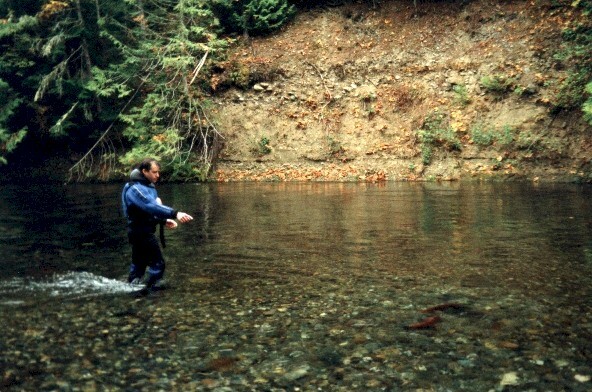 The calmer water to the left contained around 30 spawning sockeye. ...Katrina, trying to photograph some fish with her underwater camera! 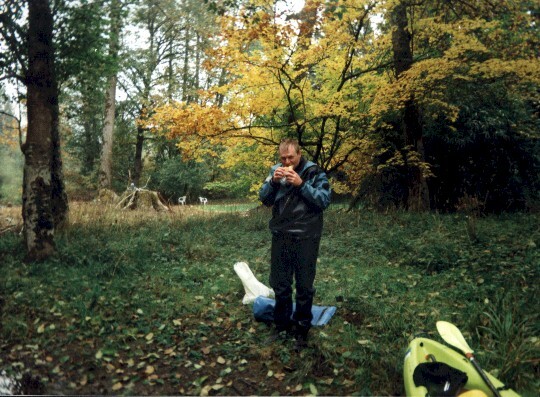 There I am pointing towards some spawning fish. We were careful to avoid their redds, which were generally visible from the light-colored gravels of recent excavations. 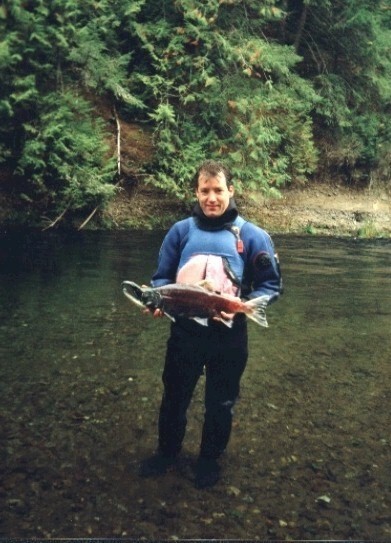 And there I am holding up a male sockeye freshly dead. Close-up of the same fish. Jeff eating lunch. As you can see, the day turned out to be a beautiful one. The morning mist disappeared and the sun came out in the early afternoon. A common sight (and smell...). Next spring millions of tiny fry will emerge from the gravels of this river and immediately swim downstream to Lake Washington. As they swim they'll feed on food nourished from the nutrients released by their dead parents. An interesting thing about sockeye is that they are either "upstream" or "downstream" lake fish. The fry, upon emerging from the gravel, instinctively know what direction (upstream or downstream) to swim to find their lake. And a lake can have both types. Not Lake Washington sockeye, though-- downstream from the lake it's a short jaunt to the ocean, and the water contains locks and a ship canal with water too deep for salmon to spawn in. By the way, the Lake Washington salmon run is not a natural run. It was established with transplanted fish from the Skagit River system (Baker Lake on the Baker River) several decades ago.